xix, 393 pages, illustrated, references, indexed. This biography has received widespread acclaim for its depth and clarity. Among the many well documented accounts provided by the author are found descriptions of such remarkable events as Tesla's 1893 demonstration of the fundamental principals of modern radio, two years prior to Marconi's showing. Tesla—Man Out of Time also includes an informative section describing his spectacular work at Colorado Springs and the Wardenclyffe installation. 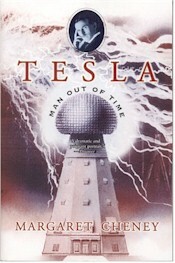 Cheney's biography of one of the greatest inventors and scientists of the modern age restores Tesla's precedence as the true inventor of radio, as well as of other remarkable firsts such as the harnessing of alternating current, remotely guided weapons, fluorescent lighting, and the bladeless turbine. The biography illuminates Tesla's relationships with George Westinghouse, J. P. Morgan, Thomas Edison, Michael Pupin, Guglielmo Marconi, and Mark Twain. Cheney also explains the controversies surrounding Tesla's unusual methods of generating publicity and his unfulfilled explorations into controlling weather and the wireless transmission of electric power. He moved scientific history forward again in the spring of 1893 when, addressing the Franklin Institute in Philadelphia and the National Electric Light Association at St. Louis, he described in detail the principles of radio broadcasting. At St. Louis he made the first public demonstration ever of radio communication, although Marconi is generally credited with having achieved this feat in 1895. Tesla's twenty-eight-year-old assistant at the St. Louis lecture was H. P. Broughton whose son, William G. Broughton, is licensee of the Schenectady Museum memorial amateur radio station W21R. At the station's dedication speech in 1976 William Broughton touched upon highlights of Tesla's historic demonstration at St. Louis after a week's preparation-as personally told to him by his father. "In the transmitter group on one side of the stage was a 5-kva high-voltage pole-type oil-filled distribution transformer connected to a condenser bank of leyden jars, a spark gap, a coil, and a wire running up to the ceiling. "In the receiver group at the other side of the stage was an identical wire hanging from the ceiling, a duplicate condenser bank of Leyden jars and coil—but instead of the spark gap, there was a Geissler tube that would light up like a modern fluorescent lamp bulb when voltage was applied. There were no interconnecting wires between transmitter and receiver. "The transformer in the transmitter group," Broughton continued, "was energized from a special electric power line through an exposed two-blade knife switch. When this switch was closed, the transformer grunted and groaned the Leyden jars showed corona sizzled around their foil edges, the spark gap crackled with a noisy spark discharge, and an invisible electromagnetic field radiated energy into space from the transmitter antenna wire. "Simultaneously, in the receiver group, the Geissler tube lighted up from radio-frequency excitation picked up by the receiver antenna wire. "What a subject! At any level the story is on par with flamboyantly contrived fiction. The record of discovery, innovation, and speculation reflects a visionary genius as fertile as any in the history of modern science....Uncommonly colourful...absorbing." "Cheney's excellent biography of one of the most idiosyncratic and truly enigmatic 'scientists' is both comprehensive and well-written....Very warmly recommended." "Excellent...a significant contribution to the recent history of science. This well-documented and exhaustive biography explores the unusual life and creative genius of this remarkable discoverer, benevolent eccentric, and solitary humanist....The author sheds new light on Tesla's relationships with Edison, Westinghouse, Marconi, and Pupin....Informative and delightful to read."